You can import your own 3D models into Tabletop Simulator with our Custom Model importer! You can choose from a few different materials to give the right sounds, as well as change the specular intensity, color and sharpness and much more! Click on OBJECTS -> COMPONENTS -> CUSTOM -> MODEL. Import files for the Model/Mesh and optionally, the Diffuse, Normals and Colliders. You can also upload the files to a webhost and input the URLs manually. Choose what type your object is. In our example, we chose Figurine so that the object is always straightened up when picked up. Next choose the Material tab. Choose what material your object is made out of. This will determine the sound and shader of your object. Go through each section to tweak the options even further if you want more control. Press IMPORT to see your custom object in game. Right click on the object and choose Custom if you wish to make any changes. Meshes/models must be in .obj format. Image files must be .jpg or .png, use .jpg to conserve ram when possible. Triangulate all your meshes/models to avoid holes. Make sure the normals on your mesh are facing the right direction. Set the origin point of the model to the center of mass for best physics. Object type controls the special properties of the objects. Mouse over each to find out more. Don’t go crazy with poly counts, use a normal map to add fine detail. Keep the vertices below 25k for best results, as any higher your objects may not import and/or crash your game. If you want more control over your models, then you might want to look into our AssetBundles. If you do not specify a custom mesh collider .obj, then the game will calculate a box collider to fit your object. 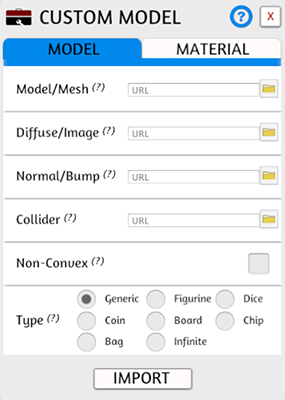 Custom mesh collider is just a way for you to have a collider that isn’t a box. Only use a custom mesh collider if a box collider will not work, due to performance. Box colliders are much more optimized in the physics engine. If your model is already sufficiently low poly enough you can use the same for the Custom Mesh Collider. Non-convex colliders allow collisions to work like the Chinese Checkers board which has indents and is concave. Convex colliders will fill in any indents or holes in the mesh due to how it calculates the collider. The problem with non-convex colliders it only works properly on locked object. If you need concave colliders and also need the object to move then you must use compound colliders. Compound colliders are multiple meshes inside one .obj file that create multiple colliders on a singular object. Compound colliders allow you make concave shapes and get around the fact that you can’t have non-convex colliders that move. Break you mesh into multiple convex shapes then export them in a single .obj file to create compound colliders. Non-convex should be set to false when using compound colliders.